Paul Van Hoeydonck carries upon his shoulders the weight of being the only artist to have ever created an extra-planetary work of art. In 1971, this Belgian artist made Fallen Astronaut, a small, 3.3-inch aluminium sculpture of a stylised anthropomorphic figure, taken to the moon by the crew of Apollo 15 as tribute to all the astronauts and cosmonauts who had died in the advancement of space exploration. Author of a multifaceted oeuvre, Paul Van Hoeydonck has always been concerned with the complex relationship between man and technology, wondering about our capacity for imagining the cities of the future, and our imaginary perception of humankind’s insufficient cosmologic knowledge. 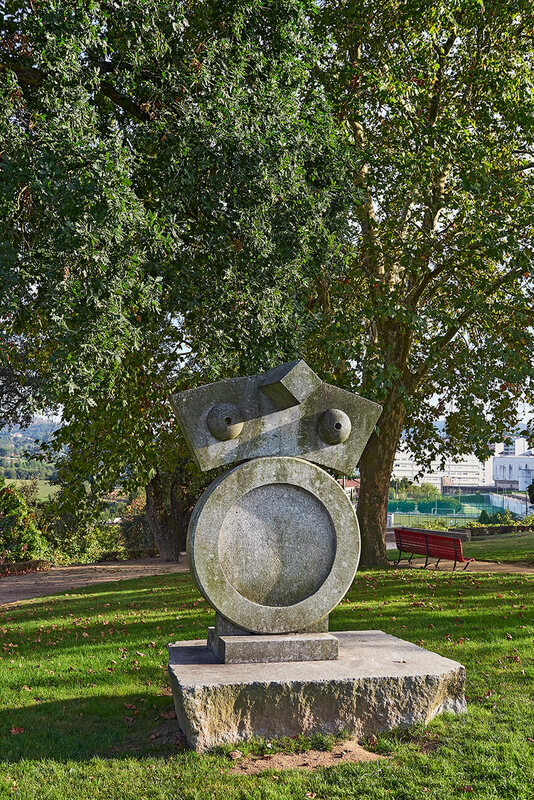 The sculpture designed for the 4th Santo Tirso International Symposium of Contemporary Sculpture shows a schematic alien, whose funny features underline the playful nature of the piece. An astonishing geometric creature makes us think of different life forms which, though natural, may call other age-old cultures to mind, in a play of time and fiction. From the mysterious monolithic stones on Easter Island to some examples of African art, many sculptural presences lie in hidden unfathomable places, challenging our awareness of global space-time.